I went to stamp club Thursday night with my friend Linda. While I didn't get much accomplished I did actually get more than I usually do accomplished. 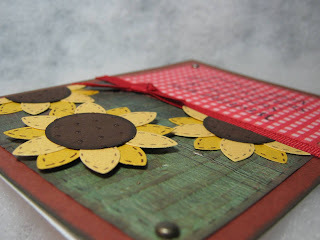 Carol, the lady who heads up the group, had sent an email that she would be bringing sunflower stamps. I thought about my large daisy punch and how I could use it to make sunflowers. I did get 4 of these cards made. 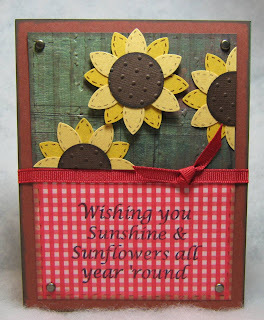 The sunflowers are made with the EK Success Daisy whale of a punch and the centers are a 1" circle punch. I used the Swiss Dots Cuttlebug folder on the centers also. I am not sure what paper the gingham is but the green is Basic Grey. Both are some scraps that Carol had brought for use. I used two flowers for each card, but I cut one in half and used it like that. I only pop dotted the full flower. I used the cuttlebug distressed stripes folder on the green paper for more dimension. The stamp was one that Carol brought. I didn't stamp anything on the inside because I thought this could be used for several different occasions and I didn't want to commit to using them for just one. I'm so glad you posted this because I wanted to lift it and forgot what you had done with the flowers! It's good to see you back online again. Thanks for sharing the card. I got 3 made today. No brads in the corners-I forgot--so I put some Glossy Accents on the flower center seeds to make them stand out. Turned out really pretty! These cards are beautiful Okie! !